Kim Hollis: What are your expectations for the upcoming Suicide Squad movie, and do this weekend's results impact your opinion in any way? Jason Barney: Not really. I was a fan of the original print stories, so I plan on seeing the movie. 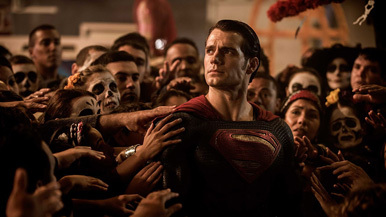 Dawn of Justice may be unwatchable, but I can compartmentalize that and move on. I'll still see Suicide Squad when it comes out. Ben Gruchow: The full trailer for Suicide Squad is some kind of weird masterpiece of timing, cutting, and music. I've been looking forward to the movie ever since the trailer was released, and DoJ doesn't affect that. It's also directed by a man with considerable skill, and instincts that appeal to me far more than Zack Snyder's do. If the DCEU has any kind of artistic future, I think it's going to look more like SS than DoJ. Felix Quinonez: I think Suicide Squad looks great and I'm really excited for it. But my excitement is based on the trailers for the movie and is completely independent of Batman v Superman. In fact I'm also very excited that someone other than Zack Snyder will be handling a DC movie. I hope it's not too late to kick him off of the Justice League movies.